Mamod steam engines are becoming increasingly popular for their simplicity of how a steam engine works - nothing can beat the smell and sound of a Mamod going. 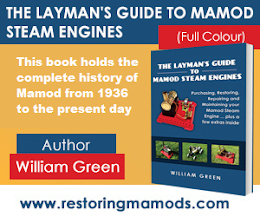 Considering I have done lots of articles on how to restore Mamods, I realise I haven't actually done an article on how to get your Mamod engine going! Therefore, here is the complete guide to making sure your Mamod steams up and runs as smoothly as possible. Your Mamod steam engine outside. You are burning fuel so never steam an engine up inside. Fuel. The fuel you can use can vary from methylated spirit to gel to tablets. Look at the 'Fuel For Your Engine' section to see the ranges of fuel your Mamod can use with prices. Remember that fuel tablets are generally the safest to use since the methylated spirit flame is invisible. Oil [optional]. Oil, for me, is a necessity to get all the moving parts flowing freely without friction. It will make your engine run smoother. A bucket of water. I like to be safe when I steam up. For this reason, I always make sure there is a cold bucket of water nearby just in case of the worst situation possible where I need to put out a fire. Heat resistant gloves. Another necessity for me, if you want to play with your engine and use things such as the whistle, it can get quite hot and can burn you. Therefore, I always wear some sort of gloves as protection from the heat. A boiled kettle. Although you could put cold water into the Mamod and light the fuel below the boiler, it will take far too long for the water to get to a temperature to make the engine run. Therefore, as well as wasting your time, you will be wasting the life span of your fuel and will most likely end up having to put more fuel in. A funnel. Getting the water into the engine can be get quite messy if you do not have a funnel to aim the water into. Therefore, to stop your engine getting wet, try to use a funnel when pouring water into the boiler. Below is a guide to the procedures you need to do to get your engine running in the correct order too (this is presuming you have all of the above equipment above). Boile the kettle and fill a bucket of cold water outside and place it near to your steam engine. While waiting for the kettle to boil, also put a little oil on the piston/cylinder assembly as well as the flywheel assembly to reduce friction. A dry engine never likes to run! Once the kettle is boiled, bring the kettle outside and, using the funnel, fill up the steam engine's boiler from the hole where the safety valve goes (which is located on top of the engine's boiler). Depending on what steam engine you have, you will either have a water level plug or a water level glass gauge to the side of the boiler. If you have a water level plug, unscrew it and fill the boiler up with water till water starts flowing out of the water level hole. If you have a water level glass gauge, fill the boiler up until you see the water level get to around 85% up (there is a small indentation on the water level gauge to show you the maximum amount of water allowed in the boiler). Never try to steam a Mamod up without water in the boiler! This is extremely dangerous. Now that the boiler is full of boiling water, it is time to light the fuel. First, put whatever fuel you are using onto the burner tray. Once you have done this, using a match, carefully light the fuel. Remember if you are using methylated spirit, it's flame is invisible.Therefore, you will have to put your hand around 20cm above the fuel to see if its hot and burning (if you are under 18, try to find adult supervision for this part). Once the fuel is burning in the burner tray, carefully place the tray underneath the boiler and wait. You can put your heat resistant gloves on now if you have them. Every 2-3 minutes, give the whistle a light tap to see how pressurised the steam is in the boiler. If it sounds like air just coming out, wait a bit longer. If it is a high pitch whistling sound coming out, the pressure will be enough to get the engine going. With most Mamods, you will act as the starter motor to getting it going. For this, you will have to give the flywheel a bit of a push to get the piston moving. If you manage to move the flywheel fast enough, the engine should continue running. If you have a lever to control the speed of the engine, you can do so now. If not, the engine will run until the fuel runs out (which is around 5-10 minutes). From doing the above instructions, you should now be enjoying your Mamod engine going! If you want to do something while your engine is running, why not try a few games I made up?